Four-color process printed on Side 1 of 80lb Smooth White stock. C1 business card slits on right pocket. 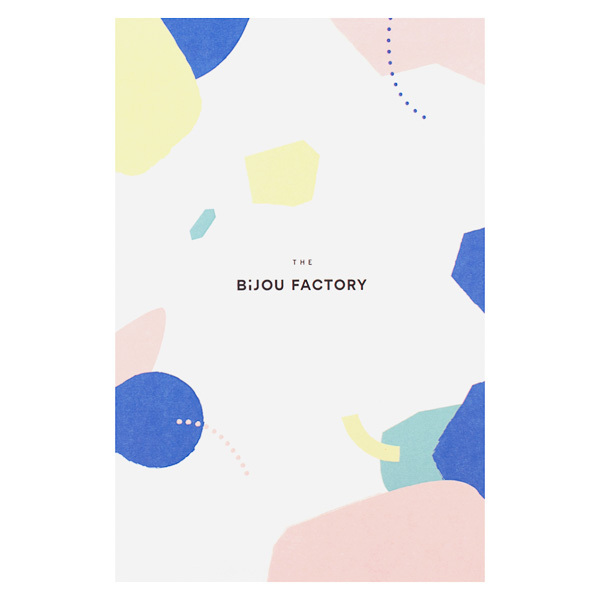 The Bijou Factory specializes in modern DIY jewelry, so its design naturally features funky abstract shapes that look like paper cutouts for a craft. Pastel pink, yellow, and teal elements add a feminine touch to the exterior, while pops of royal blue create energy. The company's name appears front and center on the cover, with its logo and URL in smaller text on the back. Four-color process printed on Side 1 of uncoated 80lb Smooth White stock. C1 business card slits on right pocket. 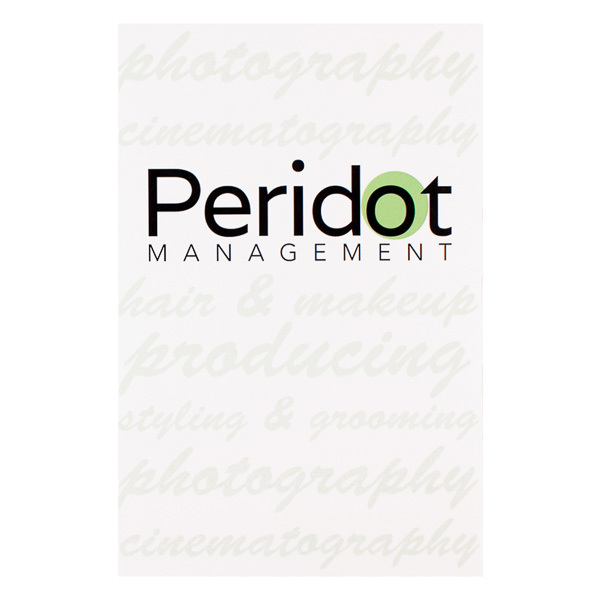 Peridot Management's cover design features its logo front and center, with its trademark green dot on the letter "o." Behind the bold logo, light script text lists several artistic careers the agency works with. Both pockets are printed in the brand's green color; a small version of the logo is located at right, while the left pocket tells recipients a bit more about the brand. Contact information is located on the back cover. Four-color process printed on Side 1 of uncoated 80lb White Smooth stock. H4 business card slits on both pockets. Delicate lilac hues look soft and feminine, perfect for a women's medical center. 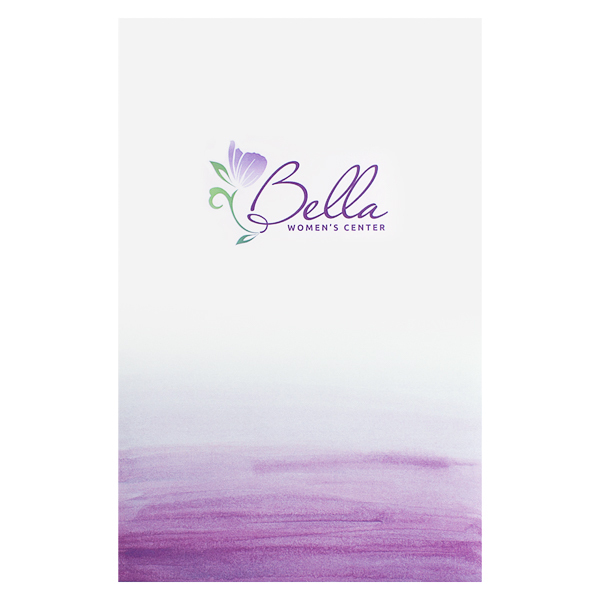 The Bella logo's purple flower and script font create a soothing, peaceful message for women dealing with unplanned pregnancies. The white interior is associated with healing and medicine. Purple areas on the outer panels add visual interest with a swirled appearance, while contact information occupies a discreet location on the back cover. Creative Loop chose a blue colorized background photo to promote its client, a volunteer doula group. The image of a mom and baby hints at a doula's role in assisting with childbirth, while its blue colorization is soft and soothing. White interior panels suggest the innocence and purity of a newborn. On the back, a green logo of a woman holding a baby mirrors the cover photo. This product's small size makes it easy to carry and store, yet its two interior pockets still offer plenty of space for items sized up to 5 1/2" x 8 1/2", including brochures, postcards, and letter-size papers folded in half. Print limitations apply: design elements are limited to 50% or less of the product's total surface area and cannot cross score lines; this lets you include only the most important elements for a streamlined design. Dimension Closed: 5 3/4" x 8 3/4"
Dimension Open: 11 1/2" x 8 3/4"